Why Buy Self Healing Cutting Mats & Drafting Tools from Cutting-Mats.net? We have an unbeatable combination of discount pricing; quality name-brand products; and friendly, knowledgable customer service. We are your trusted online source for a large selection and great prices for self healing cutting mats; art cutting boards; paper and fabric cutting tools; Alvin drafting tools; drawing art supplies; blueprint storage solutions, and more. Shop our Rhino cutting mat selection, quilting and sewing mats. We are experts at custom cutting mats-get the size YOU want to fit your table. 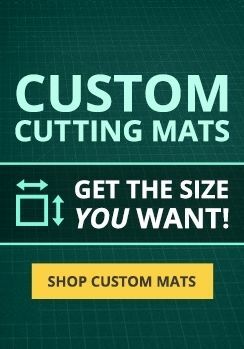 Save money, save time, order online from your cutting mat headquarters.